A jovial sneer reaches the corner of Anne Bonny’s mouth. A surly fellow known as Blackbeard, convincingly played by James Carrington, has unexpectedly encroached upon her flighty courtship of Calico Jack (Zach Thomas Woods). No strangers to trysts, Anne Bonny (Alicia Rice) and Blackbeard clearly had a thing going. In the present day, a little yelling would do. In the pirate days, a lover’s quarrel deserved a little more action, possibly swords, explosions and a stolen pirate ship? Delightfully romping through a tale of love, lust, adventure, camaraderie, swashbuckling and deception, Theater RED’s premier of Bonny Anne Bonny, an original piece written by Liz Shipe and directed by Christopher Elst, treats theater goers to a fast-paced, witty and all around fun performance. Bonny Anne Bonny centers on two seawater drinking shipmates Anne Bonny and Mary Read (Rae Pare), and their never-ending hedonistic escapades, a life’s calling to separate bounty from the hands of fools, dodge capture, and horrific untimely death. On the lam after her ship is blown up and en route to unfolding her latest plan, Anne Bonny is the hand from the past that knocks at Josiah Addams’ (Bryan Quinn) door asking for help. Josiah, known to Anne as ‘Biscuit’, tries to shield his niece Lila’s (Jessica Shultz) ears and youthful will from fulfilling her fantasy to live a pirate’s life. Lila naively jumps head long onto Anne’s coat tails. Having been forced into hearing the favor of this old friend, Josiah aides Anne Bonny in forming a rag tag crew, from a batch of wayward and not-so-seaworthy souls. Little does Anne know, that a conniving and unscrupulous military officer Captain Presley (Thomas Sebald) has enlisted some of Anne’s past and recently earned enemies to end her run of petty outlaw pillage. Satisfied only with complete annihilation of Anne Bonny, Presley finds himself gleefully using every tool at his disposal, including jealousy that has seeped into Anne Bonny’s ranks. All the while, Anne Bonny follows the course of her plan to nab enough riches to sail off the high seas of England for good. Wielding strength and cunning, Anne Bonny tries with every thread of her being to hold all the pieces of her tattered and frayed world together. Anne’s adventures lead her to ‘Heartless’ Jane Bristow, a well-weathered and crude pub matron well-performed by the play’s author Liz Shipe. Heartless Jane’s establishment gets a lot of action and gives the perfect backdrop for some of the plays best action scenes. Bonny Anne Bonny’s director Christopher Elst has made weapons and stage combat a signature element of many of Theater RED’s productions. He incorporates this element frequently and fittingly for a play about pirates. Fisticuffs, grappling and sword fighting settle impromptu disagreements throughout the play’s acts. In other more intense situations, Lighting Designer Aaron Seigmann deftly nudges our imagination of fire and explosions. The scenic design of Christopher Kurtz gives it all a place to live, a multi-level modular design that allows wood, ropes and steel to become a functional pirate ship, able to withstand highly physical blocking and aerial elements. Bonny Anne Bonny is packed with quip dialog, that melds low brow humor, double entendre, conventional wisdom, campy slap-stick humor and cynicism into a story that can be digested by nearly all ages without worry. Bonny Anne Bonny puts many talented actors in the spotlight with performances from Drea DeVos, Sean Duncan, Jennifer Glueckstein, Corey Hagen, Brandon Haut, Macie Laylan, Marah Nitz, Leah Northrop, Joe Picchetti, Grace Thompson, and Madeline Wakey. The balance of the production team deserves applause for composing a set of highly polished theatrical design elements not often experienced in an independent show. Liz Shipe and Katlyn Rogers (costume), Alicia Rice (choreography), Katelynn Bowen and Marcee Doherty-Elst (props and scenic decor), Christopher Elst and Nichole Bartsch (sound design), and Andrea Burkholder (aerial choreography). Bonny Anne Bonny is directed by Christopher Elst and Nichole Bartsch, managed by Julia Xiong, Libby Adelmayer, and Maria Carter and produced by Marcee Doherty-Elst, Christopher Elst, Jay Sierszyn and Simon Provan. 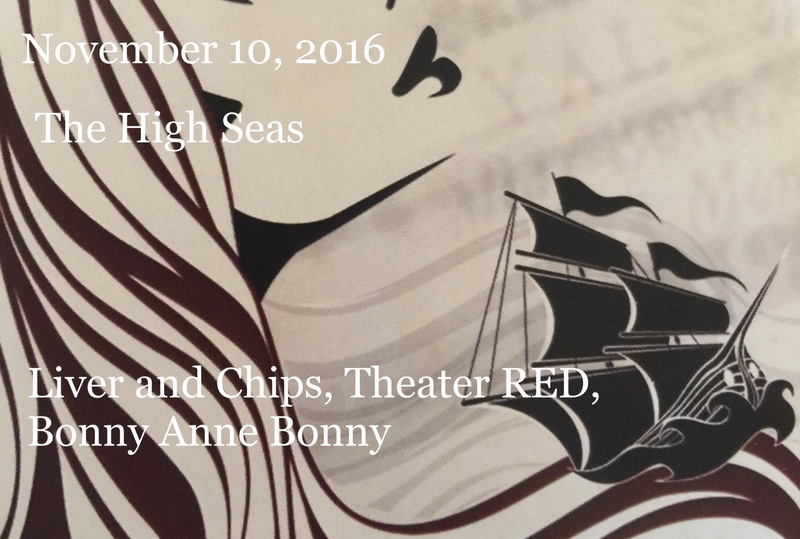 Theater RED brings you Bonny Anne Bonny at Wisconsin Lutheran College’s Raabe Theatre, 8815 W Wisconsin Avenue, with remaining performances Thursday, November 10 through Saturday November 12, 2016 with all showtimes at 7:30p. A quake, did it tremble? Brennen Steines launched season one of Coopertive Performance MKE in stellar fashion, devising and delivering Cambrian through the bodies of Kelly Radermacher and Don Russell. An escapade of process art, within Cambrian, Steines cites art forerunner Richard Serra as an influence. Cambrian employs human movement interacting with visual art media and sound design to interpret the Cambrian eon of earth’s archeology. The piece calls on the audiences’ imagination to concieve 50 million years of organic chemistry at work in time-lapse, played back in a compact and quite desciplined interpretive physical theatre duet. Cambrian’s perfomance follows a choeragraphic outline envisioned by Liz Faraglia, expounded upon during the fluid three act with movement improvisation of Russell and Radermacher. At the end of the run, a canvas will hold the emotional and creative energy of each performance. Claranetist Olivia Valenza, sat behind a small tray topped with a turntable. At her other hand, a controller running to a syth pedal serves to complete her tool set needed to orchestrate a live soundtrack to Cambrian. Valenza’s claranet envolops the performance in an ambient haze, blended with warped textures of digital and analog undertones. Her accompaniment completes the extensive immersion into this prehistoric world the audience experiences. 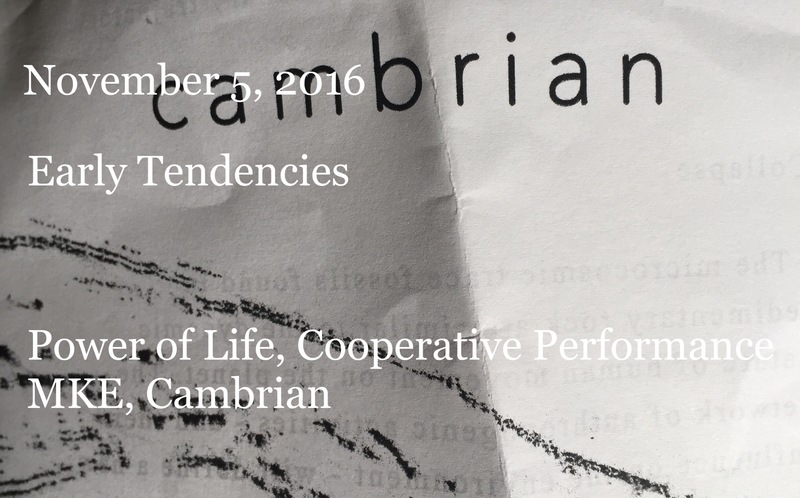 Cambrian will close this weekend, show times are 6:30p and 8:00p tonite Saturday November 5, and closing performance Sunday November 6, 2016 at 12:00p on the 5th floor of the Marshall Building in the Third Ward, 207 E Buffalo Street. The performance is viewed in roughly an 18 ft by 18 ft whitebox studio, the director prompts the audience to view the performance as one might a sculpture. 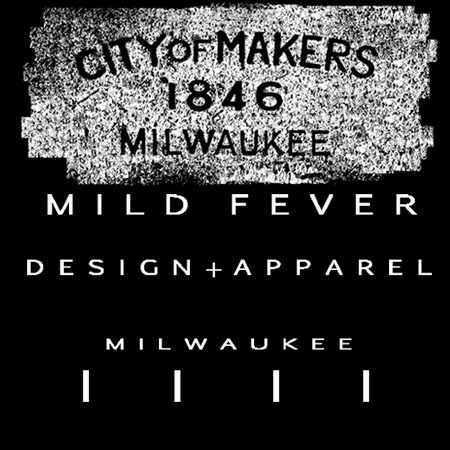 Cooperatice Performance MKE functions as and artist coop, where collectively an artist board selects project pitches from working artists.